Finally an outfit click, after ages ! Its time to enjoy pre-fall weather,and before we say bye -bye to shorts and shorter sleeves, I decided to wear my cut-out shoulder blouse, for the last time ,Moreover the upcoming month is full of festivities n weddings and planning an individualized outfit for each event and that too for the whole family, is quite a task too ! I think its time to systematically plan my shopping the way I plan my blog and my life and things will be sorted and the phase will pass leisurely . I am not complaining but these thoughts of shopping and re-doing my home have been bottling up more than any other creative outfit ideas or interesting stuff and I need a lengthy spell out of my busy schedule! You have manage to make my heart beats like crazy seeing these amazing pics with these uber cool clothes and shoes you are wearing!!! You have a new follower! Hope you'll do the same! I really like this trend!! And i love that skirt! Great Look; gorgeous! Love the LV bag. Great outift darling...I like floreal print!! love the cut out details! wow, beautiful look and bag is a dream!! Nothing goes wrong with that good ol Louie by your side lol. Yes cut out shoulders are in the limelight and it looks good! we have the same bag dear!! Lovely! I LOVE love LOVE cut-out shoulders and you styled yours so well! I really love your bag...what do you think to follow each other ? I'll wait for you in my blog..
Hello dear! Step for the first time on your blog and I must say that I was fascinated sno! you look great in envi outfits and shoes are really beautiful! P.S. do you want to follow each other? passes from me if you like and let me know! a kiss to soon .. I'll leave you the link of my blog ... I'd love to get your opinion! you look amazing. 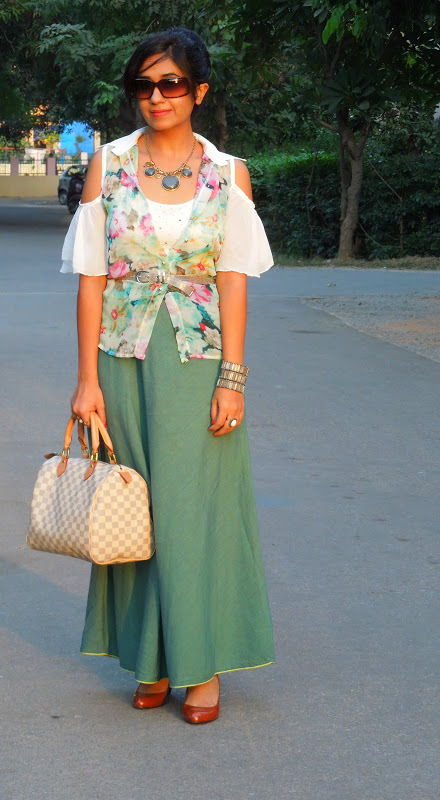 this outfit is so cool.. i find blogs from india so interesting. i'm your new follower, your blog is fabulous..
i have a new post up, would love to know what you think!! Lovely outfit! I just love the cut out shoulder detail! Pretty skirt! one of my favorite trends that came this year! Your blouse is so lovely! I love your necklace too!! Love this cut!! This top is amazing and I love your skirt ! You look gorgeous! Super stylish lovely look. Wanna follow each other? I love your skirt.. you look amazing in this photos.. I'm following you... do you want to follow me back???? stunnig outfit! love your skirt! and the parade you've shown in the post before is even better! I love your shirt and its beautiful colours! Very well styled!!! Great outfit. Pretty Oasap top! Love the shoes and the entire outfit! Very cute shirt. The floral print looks great! I love long skirts! Great flower-print top. lovely pics Surbhi..love the necklace n ur shoes! I also like the shoulder cut out trend there's just something I like about it, I like the floral top & the color combination of your outfit, you look great! Sure, lets follow each other on GFC and Bloglovin! Follow me and I will follow you back for sure! That is a gorgeous top. Do check out my new post on MMM x H&M! you look so pretty in the soft colors!! love the skirt!! yeah festive season is coming (for me it started with durga puja already) and its such a huge task to organize outfits!! ok! I follow you via gfc hope you follow me! have a nice day! Wedges are popular in these years, fashion shoes for working and daily wearing.